Glaucoma is a disease that damages the eye’s optic nerve. 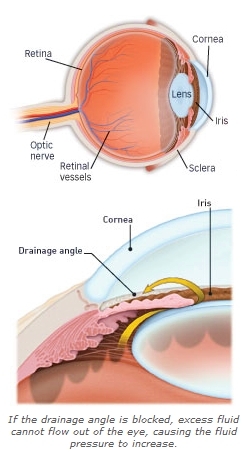 The optic nerve is connected to the retina — a layer of light-sensitive tissue lining the back of the eye. The optic nerve is made up of many nerve fibers, like an electric cable is made up of many wires. The optic nerve sends signals from your retina to your brain, where these signals are interpreted as the images you see. In the healthy eye, a clear fluid called aqueous (pronounced AY-kwee-us) humor circulates inside the front portion of your eye. To maintain a constant healthy eye pressure, your eye continually produces a small amount of aqueous humor while an equal amount of this fluid flows out of your eye.